Supplementary materials read: "Memo to E. Baker. Dec 10. 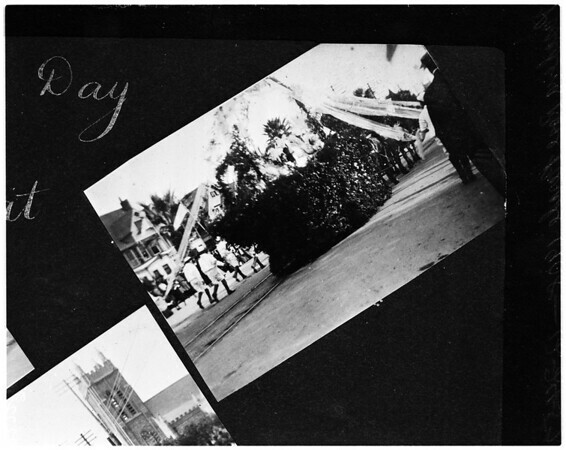 Picture on attached sheet, front side onyl, were taken at the 1908 Rose Parade in Pasadena in 1908 by R.A. Coupe, retired real estate broker, 2991 San Marino street, LA, with a little Brownie camera which still works today. Coupe, 67, could not recall what the floats represent. He does not wish the pictures detached from sheet, and he does not wish the other side disturbed. Sheet should be returned to him as soon as possible, registered mail. Adler - 420p."